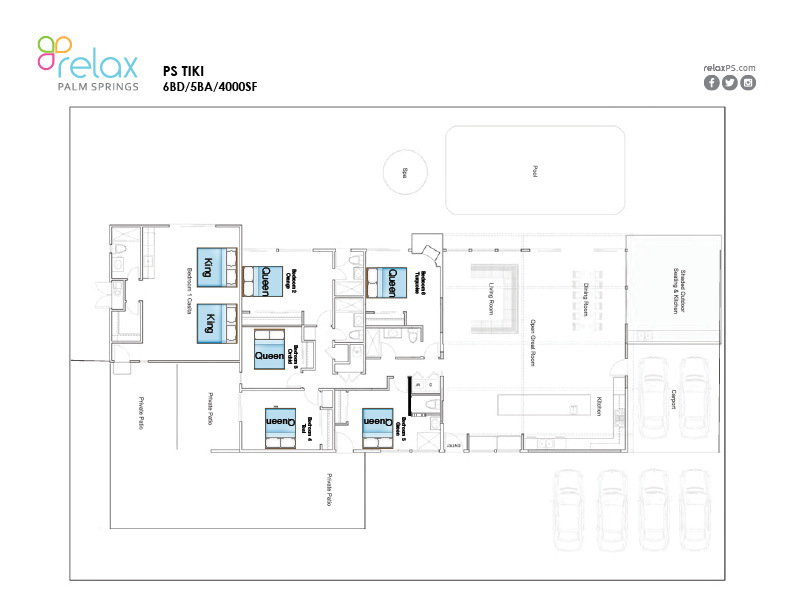 Property Size 3,700 sq. ft. This unique designer home combines an artistic mid-century design with a whimsical touch of Tiki; boasting over 4,000 sq. ft. of combined indoor/outdoor living space. This luxurious, newly remodeled custom Alexander home was originally designed by famed architect William Krisel and is the largest home of its kind in the Racquet Club Estates enclave. With 6 bedrooms, including a large casita with two king beds and a kitchenette, the house easily accommodates up to 14 people for sleeping, eating and lounging together, both indoors and out. The expanded post and beam addition honors the architectural integrity of the original Krisel design to provide a huge open-concept great room with kitchen, dining and living areas that provide warmth and intimacy while also supporting a spacious shared experience for everyone together. This is a fully green home powered by a whopping 16kw solar system, 12 tons of super efficient heating/air, state-of-the-art LED lighting throughout including touch-controlled color-changing LED mood lighting. The updated media and internet technology includes LED TVs and satellite TV in all bedrooms, USB charging ports throughout the home, video doorbell/phone/intercom system, two LED 70-inch TVs, Apple TV, Chromecast, Blu-ray/DVD/CD, house accounts for Netflix and Pandora, 5.1 home theater audio system and super high-speed internet with full coverage throughout the property. There's no limits on entertaining with three kitchens, including four sinks, three dishwashers, three refrigerators, a 1,200 watt microwave, upgraded 5 burner stove top, convection oven and a well-appointed complement of small appliances, cookware and large serving pieces. You'll love the 14-foot island/bar with plenty of room to cook, serve cocktails or create a buffet line with adjacent table seating for up to 14 people both inside and outside. The private outdoor space includes amenities such as a private outdoor shower, two shared and four private patios, chaises and enough seating for everyone. Relax under the palm trees on a queen cabana bed that overlooks a 10-person spa and a very deep, fully-tiled pool(pool heat is an optional/additional charge. See house rules for additional information). The outdoor shaded patio includes comfortable padded lounge seating, a refrigerator and sink, BBQ, picnic tables and a great view of the 70-inch TV. So, sit back, Airplay your favorite movie and grab a cold beer without heading indoors! Or snuggle into the plush fireside seating under our watchful tiki (named Yul). It's our favorite spot to hang and relax and enjoy with good friends, cocktails and conversation. This designer home is the perfect place to enjoy the company of friends or simply get away from it all. Either way, you are welcome to experience all the wonderful things this fun, elegant home has to offer. The city of Palm Springs limits your maximum vehicle count to 3 (three) cars. Perfectly dreamy! We had an unbelievable time at this house. The moment we arrived, Scott went through every detail with enthusiasm and made sure we knew everything from kitchen amenities to how to make the house light up pink for cocktail hour! Our weekend was flawless. We were all blown away by the style that this home exuded. It was packed with little details that truly exceeded the vibe we hoped for! The house was welcoming, warm, charming, and clearly designed with love and entertaining in mind. We enjoyed days and nights in the pool, meals outside, and took advantage of being so close to downtown Palm Springs. We all left longing to go back to this mid-century modern dream house! Tons of great memories were made and we hope to come back! It is perfect. This is the ultimate PS getaway property. The management was easy to work with an accommodating...and the property is absolutely stunning. Amazing Place This place is amazing. We had a group of 12 women that enjoyed this place for 5 days. It is designed perfectly for larger groups- plenty of seating for meals, conversation areas and great outdoor seating along with the fire pit. The kitchen was well stocked with cooking supplies, plates, 3 dishwashers and such. 2 washers and dryers were perfect for keeping up with wet towels and even going home with clean clothing. The pool and hot tub area a bonus as well. The casita room which is detached from the house is also a great place if you want a little bit of separation- it has its own smaller kitchen and bathroom and 2 king beds. I would 100 % go back to this house! Amazing. Scott was so helpful and informative throughout the entire process. the property has everything, the air conditioning worked beautifully for the 10 of us it was so spacious and comfortable. Highly recommend this location. Perfect. Thirteen of us perfectly fit in this awesome house. Scott was easy to work with and super responsive. There were so many details about this house that cannot be described, you just have to experience them. What's not to love? Our family had the pleasure of staying in this newly remodeled, gorgeous vacation home. The details that you see in this house make it obvious that the owners are extremely talented, and really care about the renters. Let's just say that it takes luxury to a whole new level. The kitchen has everything that you could possibly want to cook with. And BONUS - there was even an ice cream maker that we took full advantage of. Mint Chocolate Chip never tasted so good! My kids loved the fact that we were right across the street from a huge park, and so did my golden retriever. Scott, the property manager, is awesome and tends to every request. We had a wonderful holiday weekend. 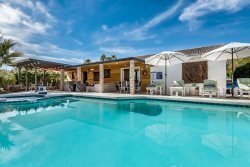 For an architecture, design and art professional such as myself, this Palm Springs vacation rental could not have been any more of a treat! Nuts and bolts: immaculately kept, crispy-bleached bed linens, extensively well appointed kitchen, plenty of hot water, well wired for internet access, very private areas, great lighting options, sleeps everyone you would want to spend a weekend with, and the hot tub actually gets hot - halleluiah! Icing on the cake: This house completely sells the Palm Springs fantasy escape. The design is over the top without being tacky - such an achievement! It includes humorous Tiki-themed art through-out, adjustable LED architectural lighting (yes, this gets another mention, it is that good), so-many-mirrors, which (paired with the lovely desert light) filled my vanity well, brilliantly conceived and implemented design elements, a variety of comfortable seating arrangements for sunning, shade and fire side, inspirational landscape design and lighting. I've waited for days now to write this because I didn't want to forget anything and leave it out. Let's start with Scott....He could've worked at the White House he was so thorough, professional, warm and detail oriented. He explained the house perfectly and let us know he could be there in minutes if there was ANYTHING we needed. Honestly, he made it so smooth and comfortable. Next, the location. Situated across from a city park gave us the perfect venue for some Bocce ball just steps away. The downtown is minutes away but not too close and shopping the same. The house is on a main street but because of the way it's built you don't encounter any road noise. The house had plenty of room for everyone to comfortably sprawl inside, outside, by the gas fire feature, covered patio, numerous lounge chairs, pool or one of several private patios.